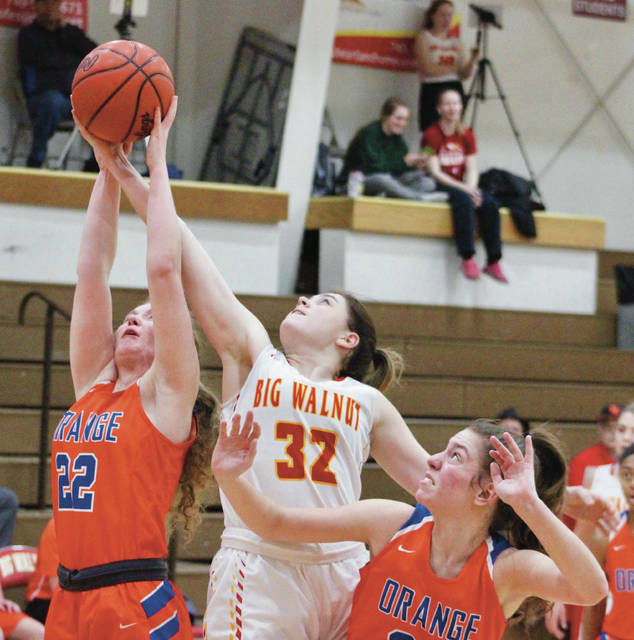 Big Walnut’s Payton Carter (32) battles for a rebound with Olentangy Orange’s Lauren Perone (22) and Riley Duffy during the first half of Tuesday’s (Jan. 15) non-league showdown in Sunbury. Scott, who just picked up his 200th-career victory in Orange’s win over Westerville North Friday (Jan. 11), coached the Golden Eagles for 13 seasons and racked up 166 of those wins before taking over the Pioneers before the 2014-15 season. So, there was no fooling one another Tuesday night (Jan. 15) … and that’s how the Eagles’ 44-33 win played out. Both teams are back at it Friday night (Jan. 18) in league competition. Orange travels to rival Liberty in OCC-Buckeye play and BW hosts Canal Winchester in OCC-Capital action. Both are scheduled to start at 7:30 p.m.